Two Mainers will be among the elite field in Boston, and Cape Elizabeth native Joan Benoit Samuelson will run on the 40th anniversary of her 1979 victory. It’s hard to be lonely in a field of 30,000 runners, with spectators lining the course of the 123rd Boston Marathon. And yet that may be the feeling for two Mainers good enough to earn bibs in the elite field. Sarah Mulcahy of Fort Kent and Michael Gordon of Portland will embark from the Hopkinton town square Monday morning ahead of the masses, which for the first time in four years will include former champion Joan Benoit Samuelson. Mulcahy, 33, will be among 67 women scheduled to begin at 9:32 a.m. Gordon, 40, will be among 62 men starting at 10 a.m.
Two minutes later, the first of four waves of roughly 7,500 runners each will be unleashed into what is expected to be raw and rainy conditions. In early November, Gordon won the men’s masters race at the USATF New England Cross Country Championships in Boston’s Franklin Park, covering eight kilometers in 26 minutes, 50.1 seconds and fending off two Massachusetts runners who finished within two seconds of him. Not that he’s complaining. Among the perks for elite runners is transportation to Hopkinton and a warm, dry area inside a church near the start line to pass the time before the race. Gordon said he feels a twinge of guilt that his Dirigo Running Club buddies will be outside in the elements for much of the morning and “it sounds like it’s going to pour.” They assured him, however, he should embrace the opportunity. Both Mulcahy and Gordon have run Boston once previously, in 2014 for her and 2017 for him, as more of a training run than a race. Another Mainer with previous experience over the storied 26.2-mile course is Samuelson. The Freeport resident and Cape Elizabeth native will attempt to finish within 40 minutes of the time she ran 40 years ago as a Bowdoin College senior when she won the 1979 Boston Marathon in 2:35:15, first thrusting herself into national prominence. Samuelson, who turns 62 in May, set a world record of 2:22:43 in Boston in 1983 and earned the first women’s Olympic marathon gold medal in 1984 in Los Angeles. She ran Boston four more times, winning the veterans division (50-59) in 2011, 2013 and 2014 and completing the 2015 race in 2:54:03. Her most recent marathon was Chicago in 2018, where she crossed the line at 3:12:13 alongside her daughter, Abby. 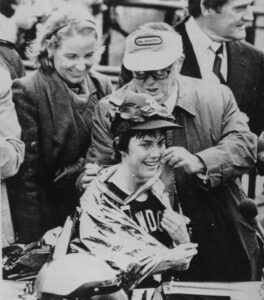 Samuelson still has the Bowdoin singlet she wore in that ’79 race, but not the blue Red Sox cap she wore backward as she strode down Boylston Street to victory at age 21. Abby Samuelson is registered but undecided about running Monday. She recently took part in a relay from Los Angeles to Las Vegas, so she may opt to join her brother and father, Scott, in cheering on Mom. A total of 171 Maine runners are entered in Monday’s marathon, including at least three with lengthy streaks. Tom Trytek of Harpswell will be attempting his 26th in a row, Bob Dunfey of Portland his 27th, and Stephen Reed of Wiscasset his 30th. Race director Dave McGillivray, who also directs the Beach to Beacon 10K, plans to extend his Boston streak to 47, less than six months after undergoing triple bypass heart surgery. 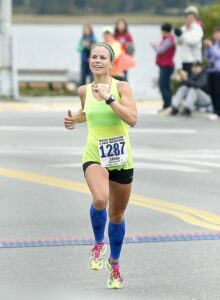 When Mulcahy ran Boston in 2014, she was six months pregnant with her daughter and called it “one of the most fun experiences of my life.” A recreational runner in college, Mulcahy didn’t enter her first road race until 2010 and her first marathon in 2012. She has won the Millinocket Marathon three times and the Bay of Fundy Marathon in Calais four times. She grew up in Eagle Lake, went to college at St. Joseph’s in Standish and taught four years in Westbrook before marrying and moving, first to the Calais area and then back to near her roots in Fort Kent. Two years ago, while 31 weeks pregnant with her son, she suffered a hip fracture that put her running career in jeopardy. She recovered, however, and this winter endured “the second-worst winter on record in Fort Kent,” she said, meaning she logged plenty of miles on a treadmill. As for Gordon, he grew up in Eastern Washington and attended college in Montana, which is where he became interested in triathlons. He went on to race professionally and has completed seven Ironmans, which end with a marathon. Upon moving three years ago to Maine, where his wife grew up, Gordon connected with the local running community. In February, he won the Midwinter Classic 10-mile race in Cape Elizabeth, and in the process set a masters record of 54 minutes, 1 second. In late March, he won the masters division of the Frank Nealon Boston Tune-up 15K in Upton, Massachusetts in 50:34. A former teacher, Gordon balances caring for his two young children and working at the FleetFeet Maine Running store in Portland. Two years ago, while recovering from an injury, Gordon ran a relaxed Boston with a woman he coaches.